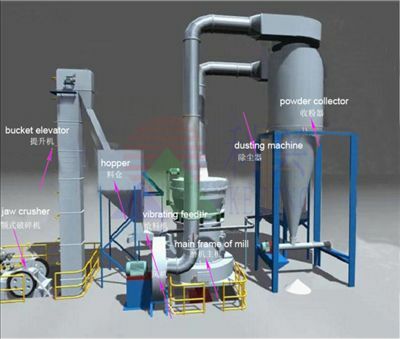 Feldspar Mill (Raymond Mill)is ideal grinding machine to grind and process feldspar, and the fine powder size can be 40 mesh to 325 mesh for industry usage. The powder output size of feldspar mill can be adjusted continuously according to the customers' demand. 1. The whole feldspar mill plant is vertical structure of strong systematic characteristic, so it occupies small area. From crushing of feldspar to grinding and packing is an independent production system. 01. Feldspar is crushed by jaw crusher or hammer crusher to the size required which is suitable for the Feldspar Mill (Raymond Mill). 02. Then the crushed feldspar are elevated into a hopper by bucket elevator from which the dolomite is transported through the electro-magnetic vibrating feeder evenly and continuously into the grinding chamber for feldspar grinding mill. The rollers oscillate outward to press the ring because of the centrifugal force and the shovel scoops up the feldspar, send to the middle between ring and roller to accomplish the grind. 03. After this, the ground feldspar are carried by the air from the blower into the powder separator (Analyzer Machine) for screening. The fine feldspar powders are blow into the cyclone powder collector and are poured out through the output-powder valve as the final products, and the corase feldspar after the screening will be recycled back into the grinding chamber for regrinding. The set’s airflow system is closely sealed up and circulated under condition of negative and positive pressure. Notice: Any change of Feldspar Mill (Raymond Mill)technical data shall not be advised additionally.